Considering a VBAC? Read this Book! Yes, research and statistics are important, but sometimes the best gift we have to offer a pregnant woman is a story. We crave the I-know-about-a-woman-similar-to-you-who-did-it stories. 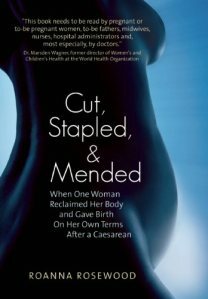 Cut, Stapled, & Mended: When One Woman Reclaimed Her Body and Gave Birth on Her Own Terms After Cesarean, by Roanna Rosewood, is such a story. I recommend it to all women who are planning or considering a VBAC (Vaginal Birth After Cesarean). I start a lot more birth books than I finish. Sometimes it feels like there isn’t that much new to say about birth. I homeschool and run my WellPregnancy business from home, so many times I put a book down to answer a kid’s question, respond to the email bing on my computer, or change the laundry, and never make it back to the book. But Cut, Stapled, & Mended I read in one gulp. Rosewood’s honesty is what makes this book about herself, her family, the cesarean births of her sons, and the subsequent, victorious homebirth of her daughter so beautiful. Without honesty, memoir is just cheesy fiction. But Rosewood’s brave drive to tell the whole truth is what pulled me into her story, and kept me turning pages until the end. As labor progresses and the contractions intensify, my mind slips away to laborland. I find myself unable to think clearly or articulate. It’s as if the left side of my brain, the side responsible for logic, linear thought, math, consequences, routine behaviors, and linguistics, has shut off. My right brain, the instinctual and emotional side I’ve long refused to acknowledge, takes over. Entirely consumed with the experience my body is going through, my thoughts are miles away and under water. Other people’s words float slowly around, some reaching me many moments after being spoken, others drifting off unreceived. In this way, I am alone in my body. The cry is primal. An entire lifetime is forgotten, leaving only this same cry that I made when I was first separated from my own mother’s body: “mother”—womb, breath, warmth, heartbeat, security. A lifetime of choosing men over women, of believing I’m capable and strong without a mother, crumbles into nothingness, washed away in an ocean of surges. Rosewood wrote her book because she sees the value in women telling their stories. She writes, “While I’m grateful for the incredible support I’ve received from both doctors and midwives, the vast majority of births, like every other bodily function, are best managed by the body in question. It’s time to put women’s needs, feelings, and intuition back in the center of the birth process. Women are the rock-stars of birth; professionals are the backup singers.” I couldn’t agree more. I will be keeping this book in my lending library next to my other favorite birth memoirs: Expecting Adam and Having Faith. And I will be recommending it to my pregnant VBAC students looking for inspiration and the “me too” experience, to the doulas and childbirth educators I mentor who seek a deeper understanding of cesarean birth and VBAC, and to anyone who wants to be sucked into a good read.